Actual Size: Length: 20'6" Width: 18'6" Height: 16'8" Weight: 348 Lbs. 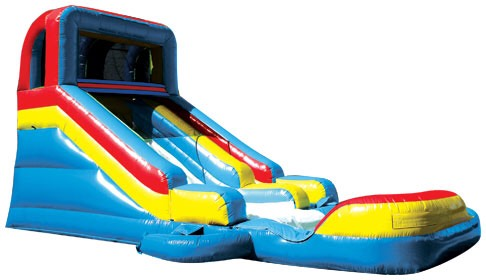 PLEASE LET US KNOW WHEN WE CALL YOU TO SCHEDULE SET UP IF USING WET SLIDE SO WE CAN INSTALL SOKER HOSE, CUSTOMER RESPONSBILE FOR HOSE FROM HOUSE TO INFLATABLE. DO NOT RUN HOSE ON FULL PRESSURE THIS WILL CAUSE TO MUCH WATER AROUND UNIT MAKING IT DIRTY/MUDDY AND HARD FOR US TO BREAK DOWN. UNIT ONLY NEED LITTLE WATER TO MAKE THE WATER SLIDE SLIPPERY.